From 1858 to 1863, gold fever invaded the interior of B.C. Two gold rushes, one after the other, brought thousands of prospectors and adventurers into what was previously native fur-trading territory. There were inevitable conflicts with the native peoples whose lives were irreversibly changed. All this activity also focussed attention on the mainland and led to increased development there. The colony of Vancouver Island was affected, too, as business boomed for its farmers, merchants, hotel owners and builders. Most miners passed through Victoria to stock up on provisions before making the treacherous journey by boat to the mainland and by foot up the Fraser canyon. 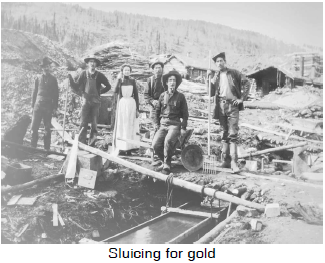 The type of mining practised in these gold rushes, and also in the later Klondike Gold Rush, was known as placer mining. This is the process of washing loose sand or gravel for gold or other minerals. This is sometimes referred to as "free" gold since expensive technology and capital investment were not required to mine it. To pan for gold, a prospector needed only simple tools to sift the precious dust from the banks of the river. The first flood of miners, the Fraser River Gold Rush, brought over 30,000 people to the shores of the Fraser from Hope to Lillooet in 1858. Most of the gold seekers were Americans looking for new opportunities after the California gold rush had run its course. In order to prevent this American invasion from threatening British sovereignty in the area, the mainland district of New Caledonia was declared to be a colony in 1858. The British system of justice was brought to bear on the American free-wheelers through the unwavering hand of Judge Matthew Baillie Begbie. Begbie also curbed the spread of Indian Wars by insisting on fair application of the law to all - whites and non-whites, alike. There were more Canadian and British prospectors involved in the Cariboo Gold Rush of 1860-63. The commercial centre for the Cariboo rush was Barkerville, named after William Barker, an English seaman who found gold in nearby Williams Creek in 1862. By 1865 the surface placer gold was almost gone. Barkerville was practically wiped out by fire in 1868. In response to the Cariboo Gold Rush, governor James Douglas built, at great expense, a 650-km road from Yale into the rugged interior of the Cariboo Mountains. This provided an important transportation route for further development of the mainland colony.